This version of the Sinn 356 Flieger II features a domed sapphire crystal (instead of the acrylic cover used on original models) and a sapphire crystal display back and decorated movement, what looks great on the front also now looks great on the back. 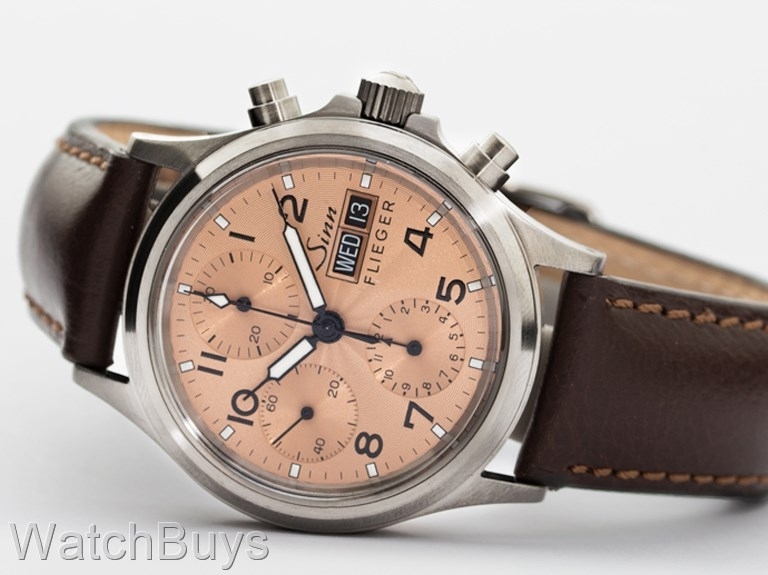 The Sinn Flieger II features one of the most striking dials we have seen. It is very difficult to tell from the picture, but the dial is a copper color rather than the orange that some computer monitors will show. The copper dial features a patterned finish that adds to the impact of the dial. Automatic winding mechanical chronograph movement with power reserve of 42 hours. The movement is shock resistant. Functions include hours, minutes, subsidiary seconds, date, day and complete chronograph functions. Case is satin finished steel with sapphire crystal back. Other features include screw down crown with protective horns, domed sapphire crystal, screw in back and water resistance to 10 ATM. 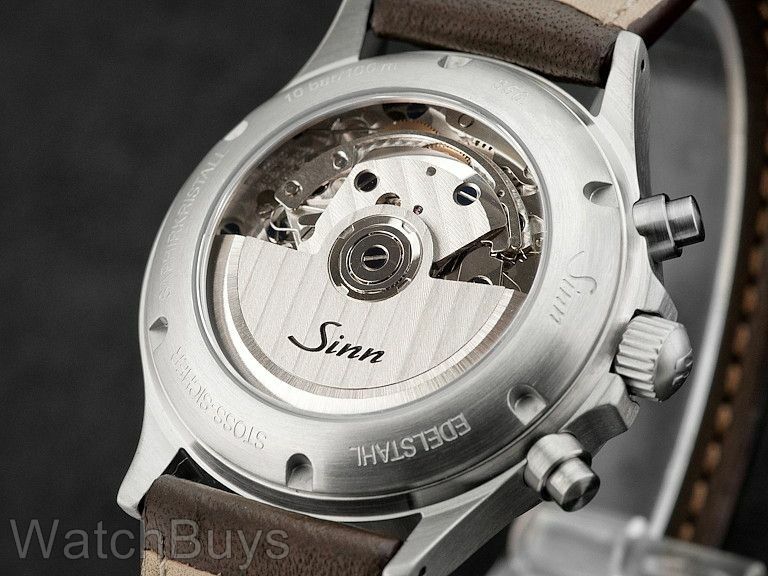 Verified Owner Comments: This is my first watch by Sinn. I am very impressed with the workmanship. What attracted me to this particular watch was the 'copper' face. Its a 'tool' watch that can be a dress watch at the same time. Purchasing this watch from WatchBuys was flawless. No hassles, watch[s] delivered on time. I look forward to purchasing more 'German' watches from them. Verified Owner Comments: It was a gift but the copper face, and very nice leather strap make is stunning to look at. They have received many complements because of its unique looks.